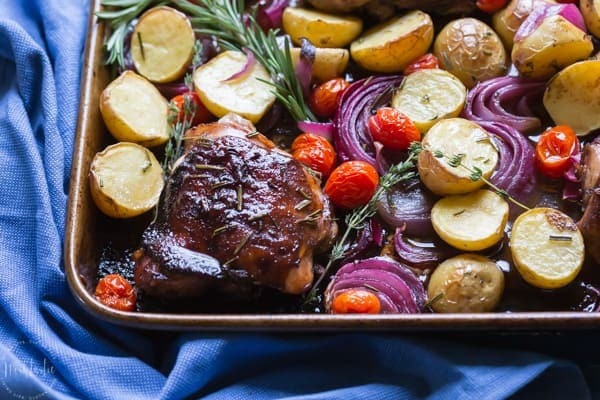 You need to try my delicious, easy, sheet pan Balsamic Chicken recipe with Roasted Potatoes, Red Onion, Tomatoes & fresh herbs! You can cook it on one pan in the oven in an hour or less! It’s such an easy year round recipe that the whole family will love, it’s one of our favorites as it has everything you need all in one pan! What is Balsamic Vinegar made of? Balsamic vinegar is a very dark, concentrated vinegar made wholly or partially from freshly pressed grape juice, and it comes from Italy. Balsamic Vinegar of Modena, is probably the type you have in your pantry and can be found in most supermarkets and grocery stores in the USA . It’s made from a combination of grape must (that’s the pressed grape juice) and wine vinegar which when mixed together must be aged in wood containers for a duration of at least 60 days. What is a good quality Balsamic Vinegar? Traditional Balsamic Vinegar (or Aceto Balsamico Tradizionale) is a type of balsamic vinegar that is made only in the Emilia Romagna region of Italy. For this recipe the supermarket Balsamic Vinegars are plenty good enough, though some versions are definitely better than others. I tend to avoid any that have added caramel color as I’m guessing that’s there to somewhat cover up an inferior product, but that’s just a hunch as I’m certainly no vinegar expert. 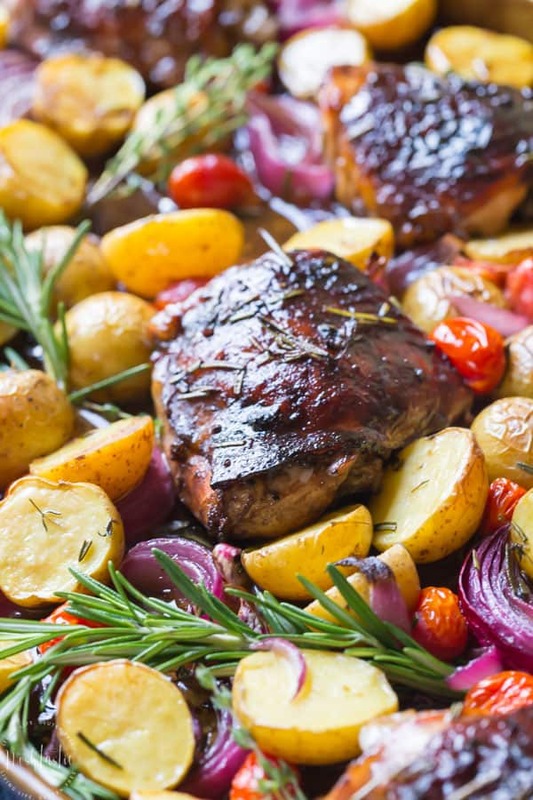 Is Balsamic Vinegar Good for your Health? Balsamic vinegar is good for your health and is low in calories, I’ve listed just a few of the health benefits below. Low Calorie – while low calorie diets have somewhat fallen out of favor recently, avoiding unnecessary extra calories is not always a bad thing! Balsamic vinegar averages about 14 calories per tablespoon, or 16g, which is pretty low. Digestive Aid – It’s said that Balsamic vinegar is good as a digestive aid, so I think it’s worth a try, plus it tastes great! The full recipe, with ingredients and directions is at the end of the post in the printable recipe card, these are a few quick tips and step by step instructions. The first step is to mix the marinade and then add the chicken thighs. I used bone in thighs with the skin on, but you can also use boneless, they may take a bit less time depending on the size. If you are in doubt use an Digital Thermometer to check the chicken. I usually always line my sheet pans before I add anything to them (I didn’t this time, as I was photographing the food) and I have found that parchment works much better than foil, as even when it’s well greased I find that food sticks to it sometimes and that can be frustrating, especially if it comes off in little pieces. 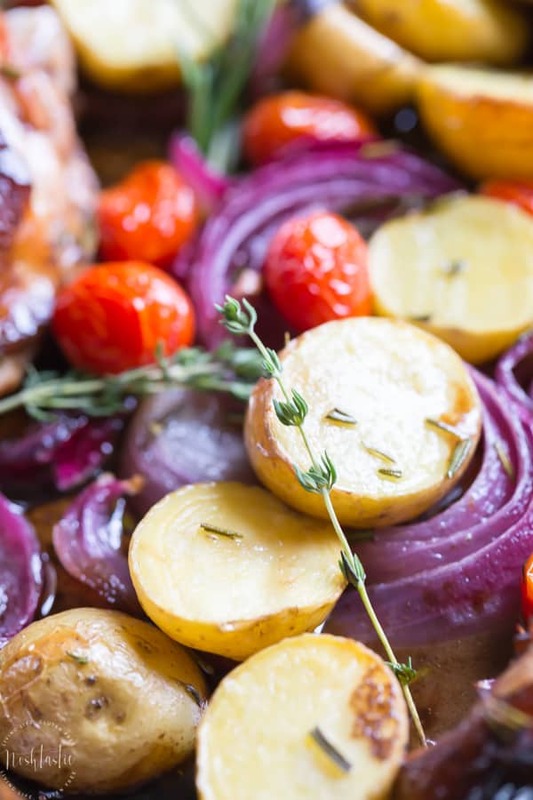 You need to toss the potatoes in a little olive oil, and then bake them first for 15 minutes before you add the chicken and other vegetables. The first time I tested this recipe the potatoes were still not done after 45 minutes total, but were perfect after 1hr. The next step is to add the chicken and all the marinade, red onion, and herbs, to the sheet pan, brush the chicken with the marinade and put it back in the oven for 25 minutes more cooking time. 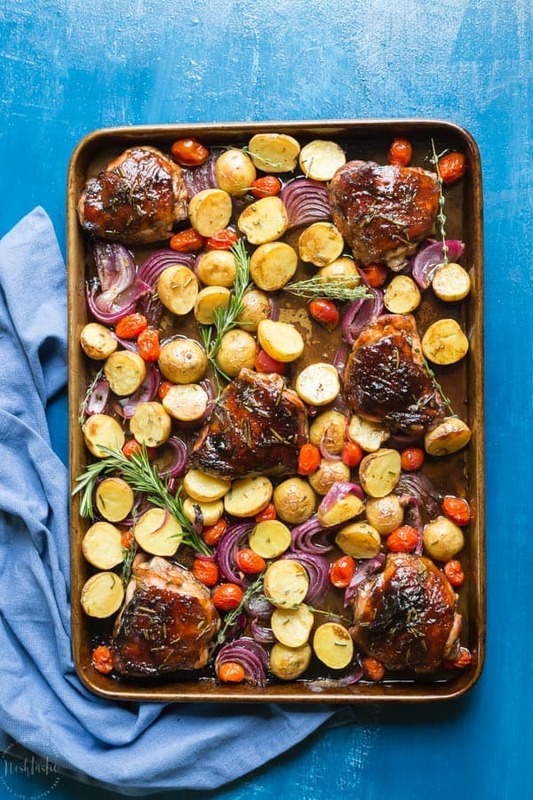 And lastly, remove the sheet pan from the oven again, add the cherry tomatoes, and spoon the balsamic sauce over the chicken pieces again before putting it back to cook for 20 more minutes. When the cook time is up, make sure the chicken is fully cooked to an internal temp 165° F.
Boneless skinless thighs are very quick to cook, skin on thighs take a little longer, and bone in skin on thighs take the longest. I’m using bone in thighs for this recipe, but you can use whatever you prefer as long as you adjust the cook time to compensate. Mix the marinade together and add the chicken, toss it around to coat it and put it in the fridge. 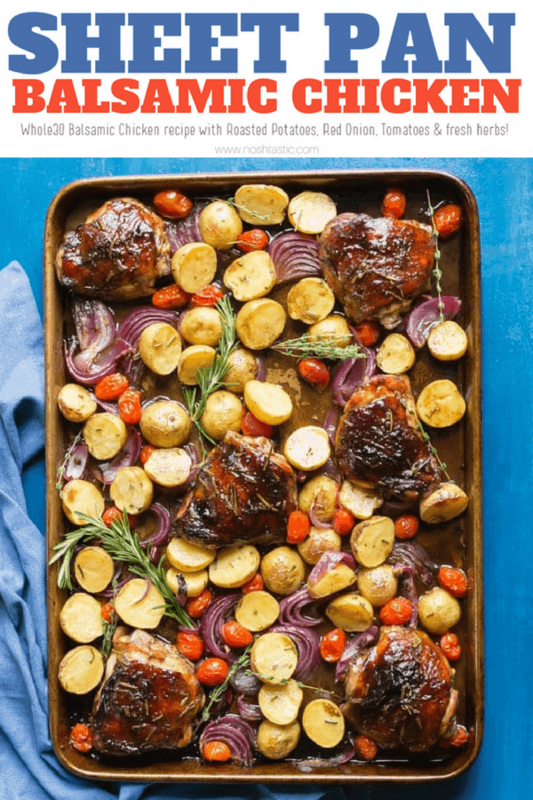 Get out a half sheet pan. You can line it with parchment for easy clean up, I find that the food will stick to foil lined pans, so I no longer use that as a liner. 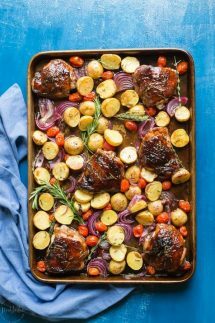 Toss the halved potatoes and onions in a small amount of olive oil, and then place the potatoes only on the sheet pan and bake for 15 minutes. Put the onions to one side. After 15 minutes, remove the sheet pan and add the red onion and the chicken along with the marinade, then sprinkle on the chopped rosemary and thyme and a little salt and pepper, and put it back in the oven. Cook for a further 25 minutes, then take out the pan again to add the cherry tomatoes, and cook for 20 minutes more. BALSAMIC VINEGAR - Any supermarket balsamic vinegar will work for this recipe, but as with anything else some are better than others and that's often reflected in the price tag. CHICKEN THIGHS - I'm using bone in for the timing of this recipe, but you can use skinless boneless thighs, or skin on boneless variety too. The skinless boneless thighs will not take as long to cook as the bone in versions so you will need to adjust the cook time to compensate for that. HERBS - I used fresh herbs for this recipe, you can use dried if that's all you have but it won't be quite the same. This is so good! Made it last night – omitted tomatoes (personal preference). My only suggestions would be to roast the potatoes even longer or cut smaller though (start with 30 minutes instead of 15) and use a regular size cookie sheet. I used a smaller “half” pan, and it barely fit – I only did 4 chicken thighs too. Really couldn’t have been easier. This recipe was amazing and I found it fool proof. But I decided not include the tomatoes for the followings times I made it. I felt like the tomatoes didn’t cook well enough and I just preferred it without. I usually make this recipe with chicken breast and it still taste amazing!! This looked amazing! While I was cooking it, I got a bit concerned about the lack of a sweetening agent. I apologize, but this was horrible. My son took one bite and said, this tastes sour. I was upset to hear that, but I knew it was absolutely true. I had even made a separate balsamic glaze that helped the chicken, but I didn’t make enough to help the veggies. A wonderful dish in presentation, though. But I can’t even offer tips to help it taste even kind of okay because it is so off. My guess is that you did not use a truly aged balsamic vinager (not usually available in a regular grocery store). A truly “aged” balsamic vinegar is quite sweet. Try finding a store that sells Balsamic Vinegar distributed by Veronica Food Co. out of Oakland, CA or an equivalent of it.